The Riverdale Rising Stars performing arts camp, Summer Stage proudly presents the Bronx premiere of DISNEY’S MULAN JR. 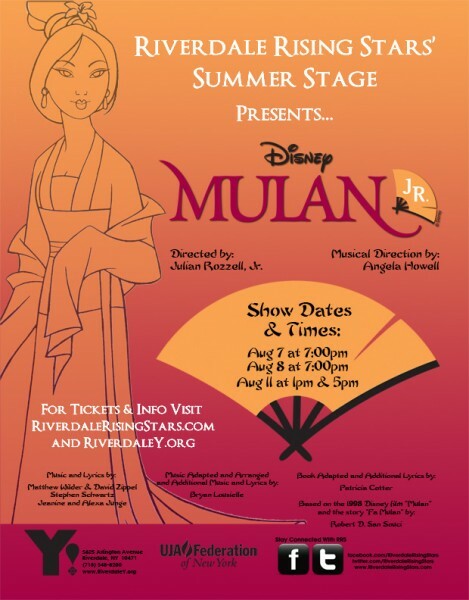 This performance is the culminating presentation of Summer Stage, The creative team for the Summer Stage production of MULAN JR. includes Director Julian Rozzell and Music Director Angela Howell. Tickets are also available by calling Brown Paper Tickets at 1-800-838-3006. For group sales, please email performingarts@riverdaley.org. Featuring a cast of 40 young actors ages 5 to 14 from Riverdale, Yonkers, Upper Manhattan, and beyond, performances will be held at the Riverdale YM-YWHA, located at 5625 Arlington Avenue (just off of Riverdale Avenue and West 256th Street), in Riverdale, Bronx, NY. As the Huns besiege ancient China, a brave young girl defies her infirm father to take his place in the army, eventually saving the life of the Emperor and bringing honor to her family and her ancestors. DISNEY’S MULAN JR. is a heartwarming celebration of culture, honor, and the fighting spirit.